We offer charming private en suite rooms with access to spacious south facing balconies, ideal for passers by wishing to rest along their journey. Longer stays at special guest rates are available upon request. Single rooms rates start from 45 Euros per room, with doubles from 68 Euro per room per night. 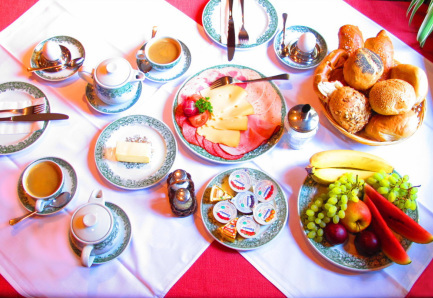 All our guests can enjoy a continental breakfast with orange juice, coffee, tea, ham, cheese, jam and a selection of seasonal fruits and fresh Broetchen. "Saubere, flinke und sehr nette Bedienung, egal ob Servicepersonal oder Chefin selbst! Dazu ein ausgezeichnetes Essen - super gekocht und gefällig angerichtet! Preise überhaupt nicht überrissen. Kann îch nur jedermann empfehlen!"